The primary purpose of the Nextcloud server-side encryption is to protect users’ files on remote storage, such as Dropbox and Google Drive, and to do it easily and seamlessly from within Nextcloud. In Nextcloud 9.0 the server-side encryption separates encryption of local and remote storage. This allows you to encrypt remote storage, such as Dropbox and Google, without having to also encrypt your home storage on your Nextcloud server. Starting with Nextcloud 9.0 we support Authenticated Encryption for all newly encrypted files. See https://hackerone.com/reports/108082 for more technical information about the impact. For maximum security make sure to configure external storage with “Check for changes: Never”. This will let Nextcloud ignore new files not added via Nextcloud, so a malicious external storage administrator could not add new files to the storage without your knowledge. Of course, this is not wise if your external storage is subject to legitimate external changes. Nextcloud server-side encryption encrypts files stored on the Nextcloud server, and files on remote storage that is connected to your Nextcloud server. Encryption and decryption are performed on the Nextcloud server. All files sent to remote storage will be encrypted by the Nextcloud server, and upon retrieval, decrypted before serving them to you and anyone you have shared them with. When files on external storage are encrypted in Nextcloud, you cannot share them directly from the external storage services, but only through Nextcloud sharing because the key to decrypt the data never leaves the Nextcloud server. Nextcloud’s server-side encryption generates a strong encryption key, which is unlocked by user’s passwords. Your users don’t need to track an extra password, but simply log in as they normally do. It encrypts only the contents of files, and not filenames and directory structures. When encryption is enabled, all files are encrypted and decrypted by the Nextcloud application, and stored encrypted on your remote storage. This protects your data on externally hosted storage. The Nextcloud admin and the storage admin will see only encrypted files when browsing backend storage. Encryption keys are stored only on the Nextcloud server, eliminating exposure of your data to third-party storage providers. The encryption app does not protect your data if your Nextcloud server is compromised, and it does not prevent Nextcloud administrators from reading user’s files. This would require client-side encryption, which this app does not provide. If your Nextcloud server is not connected to any external storage services then it is better to use other encryption tools, such as file-level or whole-disk encryption. Note also that SSL terminates at or before Apache on the Nextcloud server, and all files will exist in an unencrypted state between the SSL connection termination and the Nextcloud code that encrypts and decrypts files. This is also potentially exploitable by anyone with administrator access to your server. Read How Nextcloud uses encryption to protect your data for more information. Plan very carefully before enabling encryption because it is not reversible via the Nextcloud Web interface. 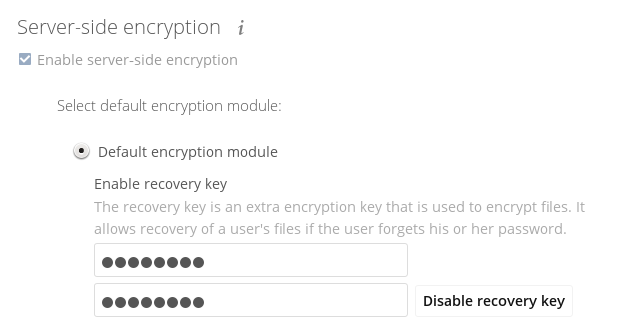 If you lose your encryption keys your files are not recoverable. Always have backups of your encryption keys stored in a safe location, and consider enabling all recovery options. 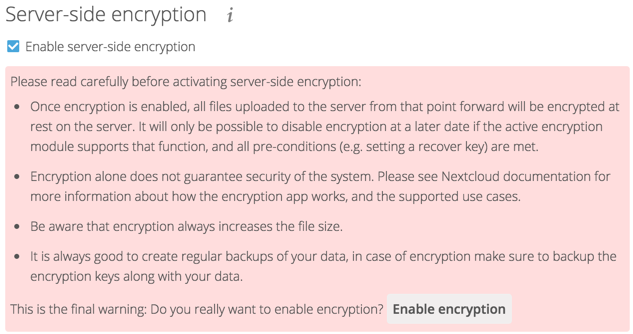 Nextcloud encryption consists of two parts. The base encryption system is enabled and disabled on your Admin page. First you must enable this, and then select an encryption module to load. Currently the only available encryption module is the Nextcloud Default Encryption Module. After clicking the Enable Encryption button you see the message “No encryption module loaded, please load a encryption module in the app menu”, so go to your Apps page to enable the Nextcloud Default Encryption Module. Return to your Admin page to see the Nextcloud Default Encryption Module added to the module selector, and automatically selected. Now you must log out and then log back in to initialize your encryption keys. When you log back in, there is a checkbox for enabling encryption on your home storage. This is checked by default. Un-check to avoid encrypting your home storage. If you lose your Nextcloud password, then you lose access to your encrypted files. If one of your users loses their Nextcloud password their files are unrecoverable. You cannot reset their password in the normal way; you’ll see a yellow banner warning “Please provide an admin recovery password, otherwise all user data will be lost”. If you have shell access you may use the occ command to perform encryption operations, and you have additional options such as decryption and creating a single master encryption key. See Encryption for detailed instructions on using occ. The [module ID] is taken from the encryption:list-modules command. You are about to start to encrypt all files stored in your Nextcloud. It will depend on the encryption module you use which files get encrypted. Depending on the number and size of your files this can take some time. Please make sure that no users access their files during this process! When you type y it creates a key pair for each of your users, and then encrypts their files, displaying progress until all user files are encrypted. If you use an external user back-end, such as an LDAP or Samba server, and you change a user’s password on the back-end, the user will be prompted to change their Nextcloud login to match on their next Nextcloud login. The user will need both their old and new passwords to do this. 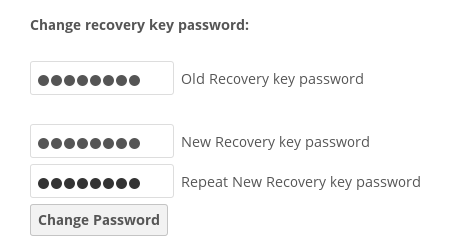 If you have enabled the Recovery Key then you can change a user’s password in the Nextcloud Users panel to match their back-end password, and then, of course, notify the user and give them their new password.